60 lots (1500 kilobars) on 1st contract day; 200 lots (500 kilobars) on any other single contract day; 200 lots (5000 kilobars) on all contract days combined. Although Singapore has historically hosted an active gold market, its gold sector has recently attracted renewed international focus due to a number of Singapore Government developmental initiatives as well as the launch of two exchange traded gold futures products. Like many other gold markets, the Singapore gold market is best viewed as a cooperative structure of market participants, exchange products, industry associations, and government engagement. Singapore is also headquarters to BullionStar and BullionStar’s shop and showroom at 45 New Bridge Road, Singapore 059398. Gold trading is not new to the Republic of Singapore. From the late 1960s, Singapore evolved into a regional gold market and gold distribution centre for countries across South East Asia, sourcing a lot of its gold from London and Zurich. In 1969, an OTC gold market was established in Singapore in the wake of the world-wide evolution of the free gold market and the two-tier price structure following the collapse of the London Gold Pool. However, from 1969, gold transactions in Singapore could only be undertaken by non-residents, and bank and bullion dealer trading in gold required authorisation from the Singapore Government. Beginning in 1973, Singapore residents were finally allowed to trade in gold, and the gold dealer licensing requirement was abandoned. Neither is gold futures trading new to Singapore. In November 1978, a group of Singapore’s bullion dealing banks and brokers formed the Gold Exchange of Singapore (GES). Founder member banks of the GES included United Overseas Bank (UOB), N.M. Rothschild, and Overseas Chinese Banking Corporation (OCBC). The GES listed two physically deliverable gold futures contracts, a 100oz and a 1kg contract. The Exchange also had its own clearing house called the Singapore Gold Clearing House whose clearing members were OCBC, UOB, Overseas Union Bank (OUB), DBS Bank, and The Bank of Nova Scotia. The GES gold contracts saw strong initial interest but trading volumes had tailed off by 1983. In late 1983, the Gold Exchange of Singapore was integrated into a new financial futures market called the Singapore International Monetary Exchange (SIMEX) SIMEX was a collaboration between GES and the International Monetary Market (IMM) division of the Chicago Mercantile Exchange (CME). In 1984, SIMEX launched a cash-settled 100oz gold futures contract, based on loco London prices. That futures contract also witnessed a gradual demise and had ceased to do any business by 1996 and was phased out in 1997. SIMEX then merged with the Stock Exchange of Singapore in 1999 to form the current multi-asset Singapore Exchange (SGX) financial platform. On the back of the multi-year gold price bull market up until 2012, coupled with the unstoppable shift in gold flows from west to east, and the evolving demand for good storage in a secure sophisticated jurisdiction, the Singapore government made a strategic decision to put Singapore back on the regional gold market map by developing the local economy’s gold sector. This support has included enactment of enabling tax legislation, the promotion of the local gold refining sector,and the promotion of the local gold market and exchange products through a number of government departments such as International Enterprise (IE) Singapore (the Singapore Trade Board). Goods and Services Tax (GST) is a consumption tax in Singapore, equivalent to the value-added-tax (VAT) concept employed in many other countries. For imports into Singapore, GST is collected by Singapore Customs at point of entry. In October 2012, in a move to encourage the development of gold trading and gold refining in Singapore, the Inland Revenue Authority of Singapore (IRAS) amended the GST Act and deemed that imports and local supply of Investment Precious Metals (IPM), including gold, be GST exempt. Given a standard GST rate of 7%, the GST exemption on investment precious metals since October 2012 has incentivised the importation of gold into Singapore. Investment precious metals exported from Singapore had already been zero-rated before the 2012 GST change, and gold exports continue to be zero-rated. The GST exemption on local supply of IPM within Singapore (i.e. delivery within Singapore) has also supported the growth of the retail, wealth management and trading components of Singapore’s precious metal investment sector. The impact of the GST exemption was noticeable as soon as 2013, with the World Gold Council reporting that “since the exemption of GST on IPM in October 2012, trade in gold has risen by 94% year-on-year between 2012 and 2013 from S$18 billion to S$35 billion”. What qualifies as Investment Precious Metals (IPM) in Singapore? The Inland Revenue Authority of Singapore has also introduced the Approved Refinery and Consolidator Scheme (ARCS). This is a government initiative which exempts precious metals refiners from GST on the importation of materials that will be processed into IPM or from which IPM will be extracted. The scheme also exempts ‘consolidators’ from GST. Consolidators are companies which aggregate materials containing gold, silver or platinum for further refining. Currently, Metalor Technologies Singapore has been designated as an Approved Refiner, and YLG Bullion Singapore has been authorised as an Approved Consolidator. The Singapore Bullion Market Association (SBMA) is a market development and promotional association for the wholesale bullion sector in Singapore. It was first established in 1993 and has 20 corporate members active in the gold industry in Singapore. A list of corporate members can be viewed on the SBMA’s website. The SBMA has been a backer of the Singapore Gold Exchange (SGX) gold futures contract and SBMA’s functions also include maintenance of the SBMA Good Delivery List and liaison with regulators. The World Gold Council’s Singapore office assists with administration of the SBMA. SBMA members include Metalor Technologies Singapore, Brinks Singapore, Malca-Amit Singapore, the World Gold Council, IE Singapore, INTL Commodities Inc, MKS Singapore, Sumitomo Corporation Global Commodities and a number of banks including Standard Bank, JP Morgan Global Commodities, the Bank of Nova Scotia, Standard Chartered Bank, UOB Bullion & Futures, and ICBC Singapore. The SBMA Good Delivery List is a list of gold refiners whose gold bars have been approved for acceptance by SMBA members for delivery in the Asian market. The SBMA list comprises a small subset of refiners on the London Bullion Market Association (LBMA) Good Delivery List, and is also used as the basis for the Approved Refiner requirement of the SGX Gold kilo bar contract (see below). The current SBMA approved refiners are: The Perth Mint, Metalor (Singapore, Switzerland, Hong Kong and US branches), PAMP, Royal Canadian Mint, Rand Refinery, Argor-Heraeus (Switzerland), Heraeus (Hong Kong), Johnson Matthey (Canada and US branches), LS Nikko Copper (South Korea), Sumitomo Metal (Japan), Logam Mulia (Indonesia) and Republic Metals Corp (USA). Note that the US operations of Johnson Matthey are now owned by Asahi of Japan. SBMA’s office is at 9 Raffles Place, Level 57, Republic Plaza, Singapore 048619. Notably, this is also the World Gold Council’s Singapore address. There are 2 gold futures contracts listed in Singapore from 2 distinct providers, the Singapore Exchange (SGX) listed kilobar gold futures contract, and the ICE Futures Singapore kilobar gold futures contract. Both contracts are physically deliverable, the main difference between the two is that the SGX contract has a lot size of 25 kilograms whereas the ICE contract has a lot size of 1 kilogram. The SGX contract is therefore pitched at the wholesale sector whereas the ICE contract is accessible to the retail sector. SGX is Singapore’s main securities exchange, and one of the region’s largest. SGX is regulated by the Monetary Authority of Singapore (MAS). ICE Futures Singapore is an approved Exchange within Singapore and is also regulated by MAS. ICE Futures Singapore is a division of ICE, and part of the Intercontinental Exchange group. The SGX physically deliverable gold kilo contract was launched in October 2014, as an initiative between Singapore Exchange (SGX), IE Singapore and the World Gold Council, with support from the bullion bank members of the SBMA. With a trading lot size of 25 kilograms, this contract was structured to appeal to the wholesale market. Since launch in mid-October 2014, there has been very little clearing volume in the SGX gold kilobar contract. This low trading volume has been the result of complex product design and inflexible contract specifications. The highest monthly clearing volume was registered in the month of launch, i.e. October 2014, with 56 contracts cleared, even though this was only a partial month’s trading. The next highest volume month was November 2014 with 52 contracts cleared, followed by 44 contracts cleared in December 2014. Volumes then dissipated in 2015 with only 158 contracts cleared during the entire year, and only 4 contracts cleared in the second half of 2015. Clearing for the SGX gold futures contract is provided by Singapore Exchange Derivatives Clearing (SGX-DC), which is a 100% owned subsidiary of SGX. It is SGX-DC specifically that has entered into a gold vault services agreement (gold custody etc) with Brinks Singapore. A list of the Clearing members of SGX-DC can be viewed on the SGX website. The clearing members for SGX derivatives are the Singapore branches of ABN Amro, Barclays, CIMB Securities, Citi, CLSA Singapore, Credit Suisse, DBS Vickers, Deutsche Futures, Goldman, JP Morgan, KGI Ong, Maybank Kim Eng, Merrill Lynch, Mizuho, Morgan Stanley, Newedge, Nomura, OCBC, Philips Futures, RHB, HSBC, UBS, and UOB Futures and Bullion. Previously, a holder of gold in a KGA had to get a GDA to attest that the gold conformed to the contract specifications (e.g. assay to 99.99%, approved refinery, refiner certificate where appropriate, etc). This attestation is no longer required. While its too early to say if these changes will boost SGX contract volumes, there is another development which might in future channel much needed business to the Exchange. In last 2015, the Chinese Gold and Silver Exchange (CGSE) revealed that it has had engaged in discussions with the SGX about launching a Singapore – Hong Kong Gold Connect, whereby CGSE members would be able to trade the SGX contract from Hong Kong. If this Connect goes ahead, this in theory will open the SGX gold kilo contract to a wider audience. In November 2015, Intercontinental Exchange (ICE) launched a gold kilo futures contract in Singapore via its ICE Futures Singapore platform. The ICE Singapore platform was itself only launched in November 2015. The trading lot size of the ICE gold contract is 1 kilo, so it differs substantially in size to the SGX gold kilo contract which has a lot size of 25kgs. The ICE contract is therefore more accessible to retail investors as well as to smaller wholesalers and gold dealers. The full contract specifications of the ICE gold kilo contract can be viewed on the ICE Singapore website. ICE Futures Singapore has appointed Brink’s Singapore Pte Ltd as approved vault operator for the ICE Singapore gold kilo contract, and has appointed Metalor Technologies Singapore Pte Ltd as assayer for gold delivered to the Exchange clearing house in settlement of the contract. Philips Futures Pte Ltd, UOB Bullion and Futures Ltd, and KGI Ong Capital Pte Ltd are exchange members of ICE Singapore, and these 3 institutions provide clearing for the ICE kilo gold contract. Metalor Technologies, part of Swiss precious metals group Metalor, opened its permanent gold refinery and bullion manufacturing facility in Singapore in 2014. Metalor’s Singapore refinery has an annual production capacity of 150 tonnes of gold. The Metalor Technologies (Singapore) Pte site is located at 8 Buroh Street #01-06, Singapore 627563. The Singapore Mint was established in 1968 to cater to circulation coin requirements after Singapore’s independence. Aside from undertaking the minting of Singapore’s circulation coins, the Singapore Mint also mints commemorative Gold and Silver coins, rounds and medallions, marking important milestones along Singapore’s history. In the 1980s, the Singapore Mint was incorporated as a private limited company wholly owned by government-linked companies. In 1987, the Mint was involved in organising the first Singapore International Coin Convention (SICC) and struck its first 12 oz pure silver medallion of 88mm in diameter. Presently, the Singapore Mint continues to participate in coin shows including the ANA Coin Convention in USA, the Tokyo International Coin Convention in Japan, the Beijing Coin Convention in China, and many others. 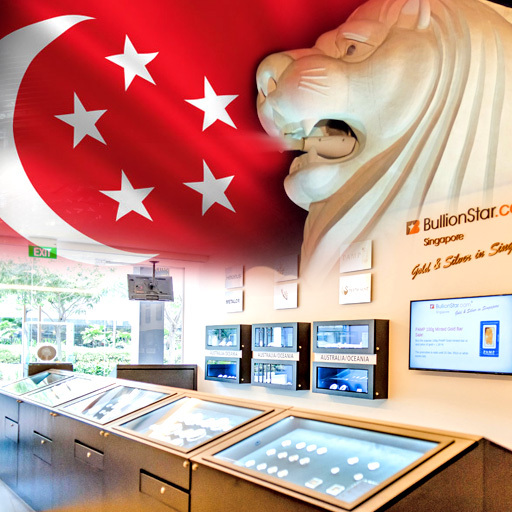 BullionStar hosts its own secure precious metals vault within its Singapore shop and showroom premises in which BullionStar customers can store their gold and other precious metals. Brinks Singapore offers secure precious metals transport and storage at two vault locations in Singapore, namely, No.1 Kaki Bukit Road 1, #02-33 Enterprise 1, and the Singapore Freeport (Le Freeport) at No. 32 Changi North Cresent, Singapore 499643, near Changi International Airport. This second location, ‘Le Freeport’, is the SGX ‘Approved Vault’ for storing the gold used in the SGX gold kilobar contract. Brinks Singapore is also the regional representative office for Brinks operations in Malaysia, Brunei, Indonesia and East Timor. Le Freeport/Singapore Freeport opened for business in 2010, and contains secure basement level precious metals vault storage, as well as above ground floors for the storage of art and other valuables. Malca Amit offers secure precious metal transportation and storage in Singapore, and its vault is also located at Le Freeport. Likewise, the investment banks UBS, Deutsche Bank and JP Morgan also lease their own vaulting space at the Singapore Freeport for precious metals storage. Since there are no licensing requirements on the importation and exportation of precious metals to/from Singapore, this environment is conducive to the trade of gold in and out of Singapore. According to the World Gold Council (WGC) gold demand trends statistics, the Singapore jewellery sector accounted for 14.5 tonnes of gold demand in 2014, while Singapore gold bar and coin demand accounted for 7.5 tonnes. In total, this represented 22 tonnes of total consumer gold demand, which was similar to neighbouring Malaysia, which registered 19 tonnes of consumer gold demand in 2014. In 2015, WGC data put Singapore gold bar and coin demand at 5.9 tonnes, and gold jewellery demand at 12.2, for a total of 18.1 tonnes of gold consumer demand. The comparable figure for Malaysia in 2015 was 15.7 tonnes. The SPDR Gold Trust (GLD) ETF is listed on the Singapore Exchange (SGX) under the ticker ‘GLD 10US$’. GLD has a primary listing in New York, and is cross-listed in Hong Kong, Tokyo and Mexico, as well as in Singapore. The World Gold Council, which is a gold market development organisation funded by the gold mining industry, maintains a regional office in Singapore at 9 Raffles Place, Level 57 Republic Plaza, Singapore 048619. Singapore’s importance as a regional gold centre has been recognised by the fact that the London Bullion Market Association (LBMA) held a Gold Market Forum in Singapore in June 2014, and the LBMA is also scheduled to hold its annual Precious Metals Conference in Singapore in October 2016. In Singapore, United Overseas Bank (UOB) offers gold certificates and a gold savings account, and also sells (and buys back) a variety of gold bars and gold coins such as the Canadian Maple Leaf, Australian Kangaroo, and Singapore Lion. UOB gold certificates are denominated in kilobars and a certificate can represent up to 30 kilobars. Certificates can be exchanged for cash or for physical gold. A UOB gold savings account allows the account holder to purchase gold in units of grams or ounces, but the gold savings account can only be redeemed for its cash value, not for physical gold. Although Singapore’s gold market has ebbed and flowed over the years, it is once again in the ascendant with the emergence of the necessary infrastructure for a viable gold market and continuing support from Singapore’s Government. Despite some teething problems for the SGX gold futures contract, 2 world-class financial exchanges (SGX and ICE) still believe it to have been worthwhile to launch a local gold futures contract within a year of each other. Futhermore, Singapore has become a location of choice internationally for the storage of precious metals, as many investment banks and precious metals storage providers will attest to. This trend has been demand driven, and is underpinned by Singapore’s success as one of the most stable jurisdictions in the world with a high rule of law and strict respect for property rights, ranking as the most business-friendly economy in the world, as well as one of the world’s largest wealth management centres. In a region besotted by gold, Singapore’s location at the heart of South-East Asia and the recent momentum in its gold market growth now looks to have put it firmly back on the map again.